For other uses, see Hubcap (disambiguation). A hubcap, wheel cover or wheel trim is a decorative disk on an automobile wheel that covers at least a central portion of the wheel, called the hub. An automobile hubcap is used to cover the wheel hub and the wheel fasteners to reduce the accumulation of dirt and moisture. It also has the function of decorating the car. A "hubcap" is technically the small cover over the center of the wheel, while a "wheel cover" is usually a decorative metal or plastic disk that snaps or bolts onto and covers the entire face of the wheel. Cars with stamped steel wheels often use a full wheel cover that conceals the entire wheel. Cars with alloy wheels or styled steel wheels generally use smaller hubcaps, sometimes called center caps. Alternatively, wheel cover refers to an accessory covering an external rear-mounted spare tire (also known as a spare tire cover) found on some off-road vehicles. Hubcaps were first used on the Newton Reaction Carriage in 1680. The first hubcaps were more commonly known as dust or grease caps. These caps threaded onto the center hub on the wood, steel, or wire wheel. These were made from the beginning of car manufacturing to 1932. Pre-1915 hubcaps were all mostly made of brass that was nickel-plated. The 1920s hubcaps were mostly aluminum. Grease caps of the wire wheel brands such as Houk, Hayes, Frayer, Dayton, Buffalo, House, Phelps, Pasco, Rudge Whitworth, Budd, and Stewart are some of the hardest to find. When a customer went to buy the wire wheels, the make of the vehicle would be stamped in the center. During 1927 and 1928, the first snap-on center caps were being made on the wire wheels. After 1932, most every car had a snap-on style center cap on the middle of their wire, steel, or wood wheels. Wire wheel center caps in the 1930s had a spring-loaded retention clip system that has been used on many hubcaps and center caps on every style of car and truck to the present day. Steel wheels in the 1930s had retention clips mounted to the wheel that snapped into a lip in the back of the cap. Wood wheels were a special option. The caps on these had a large chrome base that mushroomed up to another smaller chrome base that would have the emblem on the face. The "stem" up to the second base was usually painted black to make it look as if the top base was floating. These caps were usually made of brass, steel, or aluminum. During the mid-1930s the first full wheel covers were introduced to fit over the entire wheel, except for a small portion of the rim closest to the rubber tire. Cord and Hudson were the early adopters. Cord made a plain chrome wheel cover that had a smooth top and holes in the side. The Hudson wheel cover was flat with a lip half way to the middle and the center would say "Hudson", "Hudson Eight", or "Terraplane". This configuration differs from the "knock-off" spinners found on some racing cars and cars equipped with true wire wheels. While the knock-off spinner resembles an early hubcap, its threads also retain the wheel itself, in lieu of lug nuts. When pressed steel wheels became common by the 1940s, these were often painted the same color as the car body. Hubcaps expanded in size to cover the lug nuts that were used to mount these steel wheels. 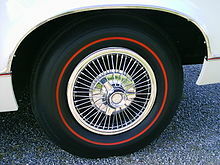 An option on some cars was a chrome-plated trim ring that clipped onto the outer rim of the wheel, in addition to the center hubcap. The full wheel cover became popular that covered the entire wheel. These became increasingly decorative in styles and were typically made from chrome-plated or stainless steel. Basic automobiles came standard with simple, unadorned, and inexpensive hubcaps were called "poverty caps" or "dog dish caps" due to their size and shape. Various optional full wheel covers of various designs were optional or were standard equipment on higher trim models. Metal hubcaps not only help protect lug nuts (that hold the wheel on) from corrosion, but also offer an audible warning should a wheel nut work their way off. During the 1960s and 1970s, automakers also offered stainless steel spoke full wheel covers that simulated the look of traditional, and more costly, wire spoke wheels. Specialty wheels of magnesium or aluminum alloy had come onto the market, and wheel covers were a cheap means of imitating their styling. Plastic wheel covers (known in the UK as wheel trims) appeared in the 1970s and became mainstream in the 1980s. The first domestic automobile to use a full plastic wheel cover was the Chevy Monza that featured a "wind blade" design and came in several colors. Plastic has now largely replaced steel as the primary material for manufacturing hubcaps and trims, and where steel wheels are still used, the wheels are now generally painted black so the wheel is less visible through cutouts in the wheel trim. On modern automobiles, full-wheel hubcaps are most commonly seen on budget models and base trim levels, while upscale and performance-oriented models use alloy wheels. Modern aluminum alloy wheels generally use small removable center caps, similar in size to the earliest hubcaps. Often a hubcap will bear the trademark or symbol of the maker of the automobile or the maker of the hubcap. Early hubcaps were often chrome-plated, and many had decorative, non-functional spokes. Hubcaps were immortalized in the Art Deco styling near the top of one rung of setbacks (ornamental frieze) incorporates a band of hubcaps on the Chrysler Building in midtown Manhattan. Part of the lore of hubcaps is that on bad roads they have a tendency of falling off due to hitting a bump. Center caps, however, fall off less frequently than older full wheel covers, which were often quite heavy. In some parts of the U.S. and in Mexico there are automotive garages whose walls were decorated with various hubcaps that had fallen off in the vicinity; they were often for sale. This problem persists today in spite of the many different retention systems that have been engineered. Hubcaps generally use either clip-on retention, where some type of spring steel clip (or plastic clip in the case of plastic hubcaps) engages a groove in the wheel; or bolt-on retention, where a threaded fastener retains the hubcap, or a plastic washer attached to the lugnut itself holds the hubcap on. Honda and, to a lesser degree, Hyundai tend to use the latter system. Clip-on hubcaps tend to pop off suddenly when the wheel impacts a pothole or curbstone, while bolt-on hubcaps are more likely to vibrate loose over time, and tend to rattle and squeak. To prevent loss, many owners attach plastic wheel trims to the wheel itself using an electrical zip tie, which are sold in a silver colour for this very purpose. Enterprising manufacturers also sell a small kit consisting of spare zip ties, a pair of cutting pliers and latex gloves to allow a trim thus secured to be removed easily in the event of a puncture. In the U.S., during the age of custom cars (1950s–early 1960s), decorating one car with the wheel covers from another was common. Two very desirable wheel covers were those of the 1950 Cadillac (called the "Sombrero") and that of the 1953 to 1955 Oldsmobile, which resembled a huge, three-tined spinner. Aftermarket suppliers included the "Mooneyes" brand (named after the firm's founder Dean Moon) hubcaps and wheel covers that were some of the first independently offered for hot rods and custom cars. Another variant of the wheel cover, known also as wheel shrouds or rim blanking, is that commonly associated with the German wheelmaking brand BBS since the 1970s. These are attached onto the wheel first, then bolted on as if the driver or mechanic is bolting the wheel to his car in the manner of changing their wheel. Commonly made from aluminum, they are designed to distribute airflow to the brakes, thereby generating downforce depending on the shape. Thus, these wheel covers are functional rather than merely decorative. From 2006, to get around FIA technical regulations that all wheels must be made from an homogeneous metallic material, a carbon fiber variant found its way into Formula One when it was used by Scuderia Ferrari whom BBS supply its wheels to. At the Turkish Grand Prix, the rear shrouds were also adopted by Toyota and Toro Rosso and thus their use became widespread for all teams. Prior to being banned from the 1994 PPG Indy Car World Series, wheel shrouds were popular on superspeedways until Team Penske revealed that those covers could reduce drag by 2.5%. Another type of wheel cover, the static wheel fairing, was introduced by BBS for Ferrari at the British Grand Prix to act as a brake cooling aid for front wheels whilst remaining stationary the wheel itself with one part being cut out at a 27° angle to enable hot air to escape and thus became adopted by every team. The wheel covers were banned from use in F1 from 2010 after incidents where they broke loose in races. To get around the ban, Ferrari used a detachable integral aero device made from the same magnesium material as the wheel itself, which consisted of double concentric rings of different diameter. As parts of cars now have to be homologated, its rivals were unable to copy this device. Its use became eliminated when the FIA revised the regulations for 2011 to prohibit wheel materials in certain exclusion zones. A non-rotating hubcap retains the same orientation even when a vehicle is in motion. An example is the Rolls-Royce whose hubcap centers are weighted and mounted to revolve independently of the wheel rotation, thus the RR logo can be read while the vehicle is in motion. This design also allows for messages or advertising to be placed on the hubcap and be read while the vehicle is moving. Non-rotating hubcaps with advertisements may be found on race cars, taxis, commercial vehicles, industrial machinery, buses, and golf carts. A nave plate is a large hubcap in the form of a plate which covers the entire wheel. Nave plates were used in the 1920s and 1930s to cover wire wheels (which are lighter and truer running than more conventional pressed steel wheels) to make them appear modern and streamlined, and to make it easier to keep them clean. ^ History News. American Association for State and Local History. 1976. p. 222. Retrieved 13 January 2014. ^ St. Clair, Prentice (April 2013). "IDA Certification – Study Guide: Wheels and Tires". Auto Laundry News. Retrieved 13 January 2014. ^ a b Browne, Ray B.; Browne, Pat (2001). The guide to United States popular culture. Bowling Green State University Popular Press. p. 416. ISBN 9780879728212. Retrieved 13 January 2014. ^ a b "Understanding the Purpose of Hubcaps". Hubcaps Unlimited. Retrieved 13 January 2014. ^ Breitenstein, Jeff (2004). The ultimate hot rod dictionary: a-bombs to zoomies. Motorbooks International. pp. 64 and 158. ISBN 9780760318232. Retrieved 13 January 2014. ^ Tom & Ray (1 January 2010). "Ever wonder do hubcaps serve any purpose". Car Talk. Retrieved 13 January 2014. ^ "The Midtown Book". The City Review. Retrieved 13 January 2014. ^ "The Chrysler Building, 1926–1930". Picturing America - Artwork, Essays, and Activities (PDF). National Endowment for the Humanities. 2008. p. 68. ISBN 9780615207933. Retrieved 13 January 2014. ^ Schmidt, John R. (2014). On This Day in Chicago History. The History Press. p. 31. ISBN 9781626192539. Retrieved 13 January 2014. ^ "Hubcaps 101". Hubcaphaven.com. Archived from the original on 10 March 2008. Retrieved 13 January 2014. ^ "The History of Hubcaps and Wheel Covers - American Wheelcovers". Hubcapmike.com. Retrieved 13 January 2014. ^ "Race Engine Technology : Formula One Technology". www.motorsportads.com. Retrieved 12 June 2016. ^ Collins, Sam (6 September 2013). "Wind Cheaters - 11 ways F1 teams increase top speed (UPDATED)". Racecar Engineering. Retrieved 12 June 2016. ^ SEAS. "Wheel Shrouds". www.formula1-dictionary.net. Retrieved 12 June 2016. ^ Simanaitis, Dennis (29 May 2003). "2004 Rolls-Royce Phantom - Not your (affluent) father's BMW". Road and Track. Retrieved 13 January 2014. ^ Zipern, Andrew (14 May 2001). "MediaTalk; In Los Angeles, the Hubcap as Billboard". The New York Times. Retrieved 13 January 2014. ^ "Non-rotating hubcap". Farm Show. 1992. p. 17. Retrieved 13 January 2014. This page was last edited on 25 July 2018, at 19:17 (UTC).